This week on our show, Brian and Liam are back together, and this time they’re talking Comics, they’re talking games, they’re talking Luke Cage, and they talk a little bit about The Walking Dead. This episode is brought to you by the Forest City Comicon, November 5th through November 6th at the London Convention Centre. The largest event of its kind in London, A celebration of nerd culture like no other: The Forest City Comicon is a London, Ontario-based Comic Con. For the first time in the history of their podcast, Brian and Liam will host a LIVE edition of the Sequential Fiction MEGAcast. We’ll have comic picks, we’ll chat about TV Shows and media, do some audience Q&A, and feature a surprise guest or two! Dedicated to battling the forces of evil, delivering goodness, and eradicating boredom wherever they find it, they are the warriors of Sequential Fiction! Cerebus is a comic book series created by Canadian cartoonist Dave Sim, which ran from December 1977 until March 2004. The title character of the 300-issue series was an anthropomorphic aardvark who takes on a number of roles throughout the series—barbarian, prime minister and Pope among them. The series stands out for its experimentation in form and content, and for the dexterity of its artwork, especially after background artist Gerhard joined in with the 65th issue. As the series progressed, it increasingly became a platform for Sim’s controversial beliefs. Luke Cage is the latest Marvel series on Netflix, and all 13 episodes dropped on September 30th. 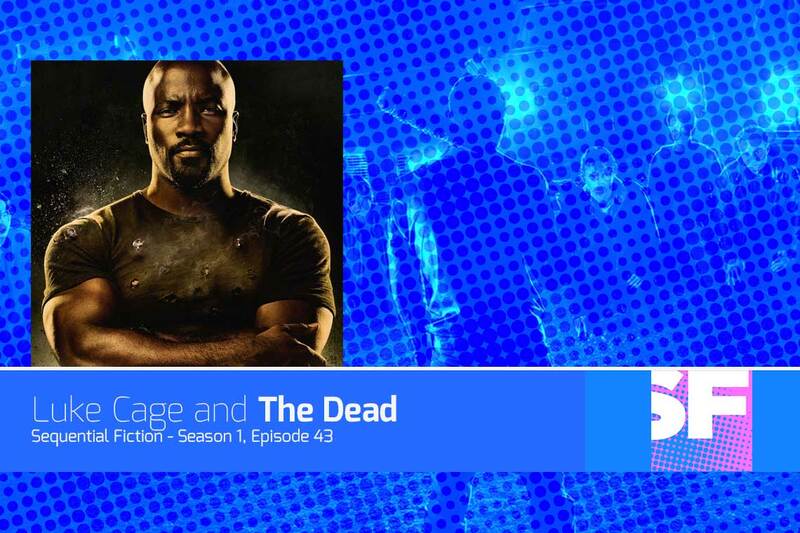 The series takes place after the events of Marvel’s Jessica Jones, and features Luke Cage and Misty Knight as well as the villain Cottonmouth. The series is 13 episodes, and all 13 of them are available now. The Walking Dead is back October 23rd, so we talk about Negan, and throw out some ideas of who Lucille’s victim may be. This is a spoiler free conversation, and has some pure speculation on our part with absolutely no insight into what may happen.